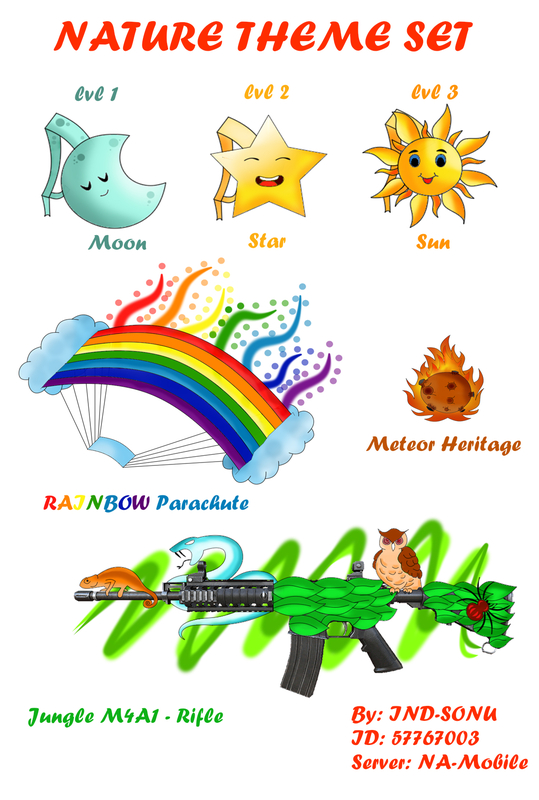 So I have designed this 'Nature Theme Set' for Rules of Survival which consists of 3 Backpacks, a Parachute, Heritage, and M4A1 Rifle Skin. - Level 1 'Moon' Backpack. An amazing RAINBOW Parachute which has Rainbow glitters as its trails, which can be seen behind the parachute. A 'Meteor on Fire' as the Owner's or Enemy's Heritage. And at last, the Jungle themed M4A1, it basically shows various wild creatures and animals which you'd see in the Jungles like, Spider, Snake, Owl or Lizards/Chameleons. I hope you like my Entry, If you do, please hit that support button. I like the bags and the Parachute, good work.. I support you.